New England residents, and anyone visiting Boston later this year, mark your calendar for one of the most fun landscape and gardening shows in the country. New England Grows is returning to Boston in 2016, and it will bring fresh floral displays, new vendors, and more opportunities to celebrate flowers and nature. New England Grows is a popular flower and garden show that takes place minutes from Downtown Boston. It’s combing back for three days of flower and gardening thrills, from November 30th to December 2nd, and it will take place again at the Boston Convention and Exhibition Center. New England Grows will feature horticulture shows, vendors, and many chances to learn about beautifying your home with flowers. The event gives show visitors access to a huge showroom filled with contemporary exhibits as well as many products that will help you become an expert gardener, if you’re not already a pro. New England Grows typically features about 100 merchants who display their beautiful flower art and landscaping ideas for the public. They bring show attendees the best in floral presentation and gardening tips, in the form of displays that can be viewed interactively and products that can be purchased on the spot. Vendors who show at New England Grows are typically eager to talk flowers with anyone who passes their booths. Over the past few years, New England Grows has upped the number of merchants displaying, and selling, at the show and attendance has increased tremendously. The blossoming popularity of New England Grows is due to many factors, one being the opportunities it affords to speak face-to-face with garden curators. Guests also love to witness the brilliant floral art created by some of the top artists in the industry. New England Grows showcases landscaping design experts from all over the world who come to share their knowledge about green gardening, gardening in tiny spaces, drought landscaping, and more. The show features several seminars each year as well as, a huge marketplace with useful products for gardeners and anyone who loves flowers. 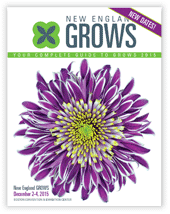 If you’re interested in attending the show this year, visit the New England Grows website. Expo hours are already posted, and you can learn more about the activities that will take place at the event. Have you attended New England Grows? Feel free to leave us a note in the comments below and tell us what you thought of the show! New England residents, and anyone visiting Boston later this year, mark your calendar for one of the most fun landscape and gardening shows in the country. New England Grows is returning to Boston in 2016, and it will bring fresh floral displays, new vendors, and more opportunities to celebrate flowers and nature.New England Grows is a popular flower and garden show that takes place minutes from Downtown Boston. It’s combing back for three days of flower and gardening thrills, from November 30th to December 2nd, and it will take place again at the Boston Convention and Exhibition Center. New England Grows will feature horticulture shows, vendors, and many chances to learn about beautifying your home with flowers. The event gives show visitors access to a huge showroom filled with contemporary exhibits as well as many products that will help you become an expert gardener, if you’re not already a pro.